I have found documented proof dated April 2015 that at least 10,000 perforated inverted frame error forgery sets have been moved onto the market! I have recently discovered that modern fake stamps of this issue are being sold onto the market. I can tell you that real dangerous	fakes or some call forgeries are being flooded on the market as I write this page in August of 2015. My research into the printer has enabled me to discover modern fake stamps have been created in 2014!! They are being spread across the world through online auction sites like ebay and Delcampe. Everything about them is fake except for one dangerous fact, they have the correct perf size. The gum type is different in it being white in color and very shiny. This gum type was not used until much later years, long after Format went bankrupt thus proving they were not produced by the Format International Security Printers. Obvious differences will be shown below. 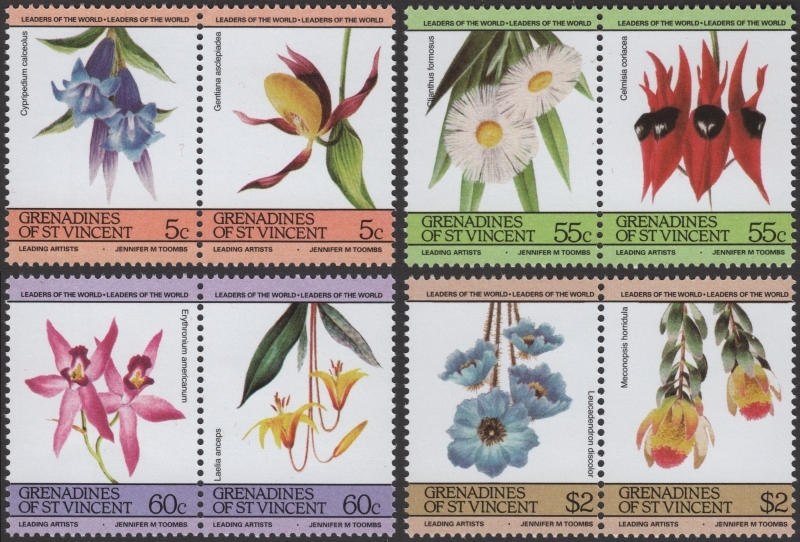 So far I have discovered complete sets of fake inverts of the Saint Vincent Grenadines 1985 Flowers issue. More than likely forgeries of the normal issue are being seeded onto the market as well. All are being offered online right now as I write this on August 7, 2015. 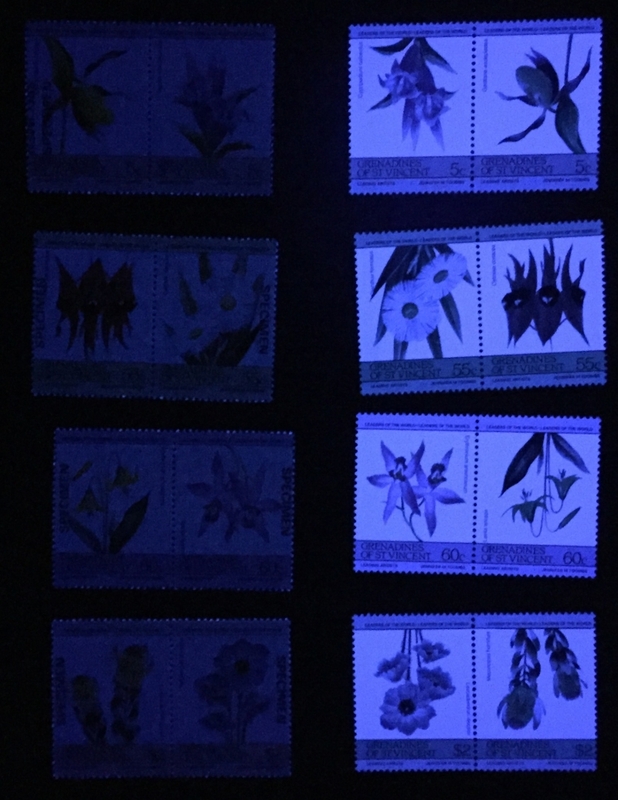 Recently I noticed sales of the Saint Vincent Grenadines 1985 Leaders of the World Flowers issue being sold as inverted frame errors on ebay from Stampbank of London in the UK at a cost of around $25.00. I had already discovered the seller is selling other fake invert sets and so I purchased a set and was amazed to find it is from a completely different printing than the originals! The colors, screens, fonts and gum completely differ. With my suspicions up I checked other lots on ebay looking for odd Flowers lots but at this point have not found any but because these are being produced fear that other varieties will appear soon! As of 2017 I have watched several of the above noted sellers on eBay including this stampbank guy selling these fakes. Stampbank only offering a singles set for the above mentioned price while armi777 and some of the others offering these forgeries in strips of 5 at the 99c price. This armi777 and the others did not even mention that they are invert "errors" either because they are too stupid to recognize them as such or because they did not want to draw attention to them with intent to move the forgeries and make as much money off of them as possible before anyone caught on. Sorry to say dude(s), I caught on quick and got the imaged forgeries in the strips for dirt cheap! In scanning eBay and Delcampe today (October 8, 2017) I found only one seller on eBay offering a set of these. The user is alexunitrad. Tried to contact through eBay and cannot. Seller does not mention they are inverts. Seems majority of offers are from stock purchased from the Latvian sellers. Advise to be wary of the seller until he analyzes and gets rid of the forgeries. 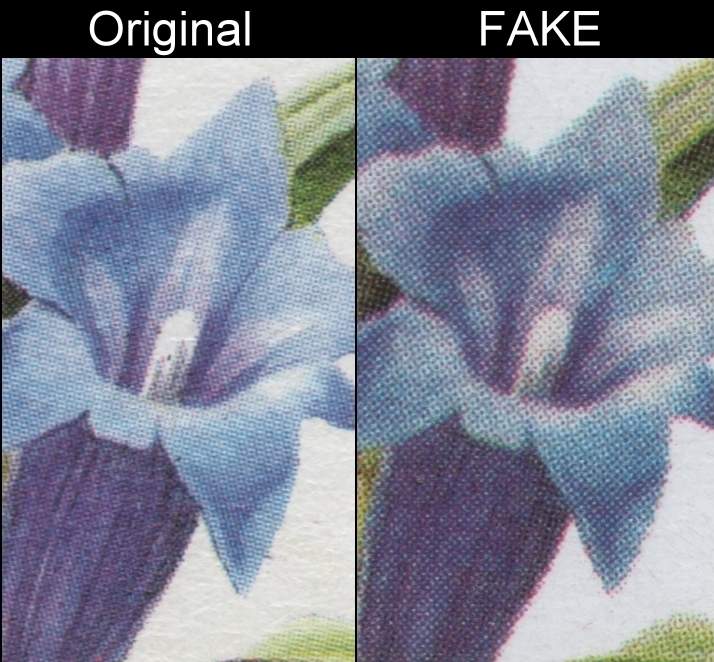 The first clue that tells you the inverted stamp sets are fakes is....INVERTS ARE ALL FAKE! No inverts of this issue were ever produced by the Format Printers. THE BACKGROUND COLORS OF THE FRAMES ARE COMPLETELY DIFFERENT ESPECIALLY ON THE 5c AND $2 VALUES!! ANYBODY WHO CANNOT NOTICE THAT AND IS TRYING TO SELL THESE FAKES SHOULD NOT BE DEALT WITH IN ANY REGARDS!! Here are the differences so you can define these fakes. To show the differences I will use an original specimen overprinted set. I note that the 5c value has an overprint error that is genuine. For the perforated inverts of this issue that I have acquired, the forgeries glow brightly as this image shows. This is evidence showing even a later creation and since these did not appear on the market until 2014 and no such invert errors have ever been on the market nor recorded, it proves these to be modern forgeries of the stamps. Again there is an obvious difference in color and texture. I note you can see right through the fakes. Note the extreme difference in color on the fake stamp. The inferior screen pattern. 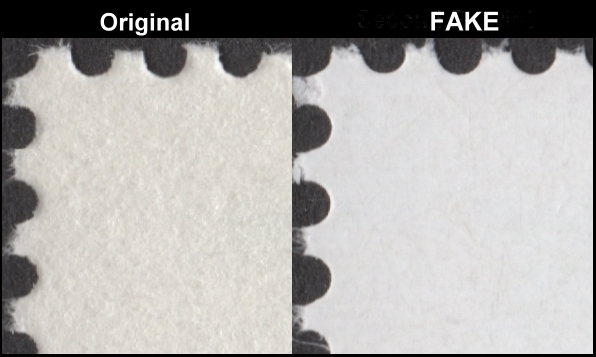 Again noting the extreme difference in color on the fake stamp. 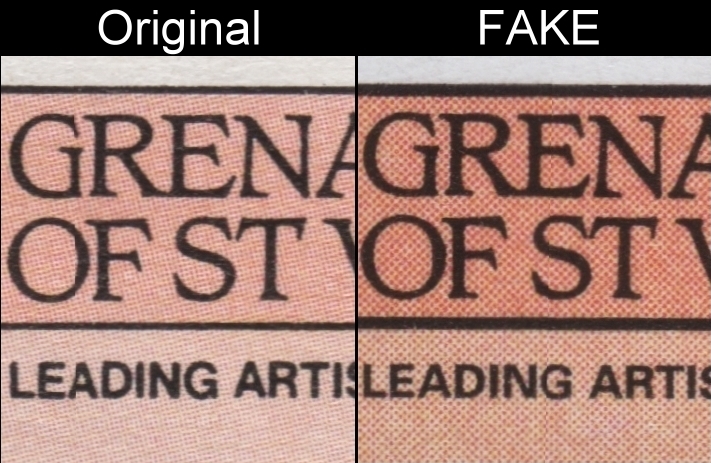 You can see the black frame lines on the fake stamp are much thicker than on the original. The inferior screen pattern is prominent in this image. Please note the extreme difference in colors on the fake stamp. You can see that the box color where the country name and value are is a completely different color being very deep colors. Again a difference in colors on the fake stamp. You can see that the background colors on both stamps is a much deeper green. The black frame bars again much thicker than on originals. Here again note the extreme difference in color of the backgrounds on the fake stamps. You can see that the lavender is much deeper and where the country name is it is almost purple! The black bars above and below the country name on the fake stamp are again much thicker. Here again note the extreme difference in color of the backgrounds on the fake stamps. You can see that where the country name and value are the color is a deep brown color. The black bars again much thicker than on the originals and the bar below the Leaders of the World logo even has an extra shorter bar on the edge appearing to be doubled! It appears the forger is putting obvious differences on these fakes just to laugh in the faces of collectors who buy them! I have created a table with links at the bottom of this page to full size images at 1200dpi for you to use to compare. It is possible and probable that the forgery ring has created fakes of the normal issues as well as imperforates. 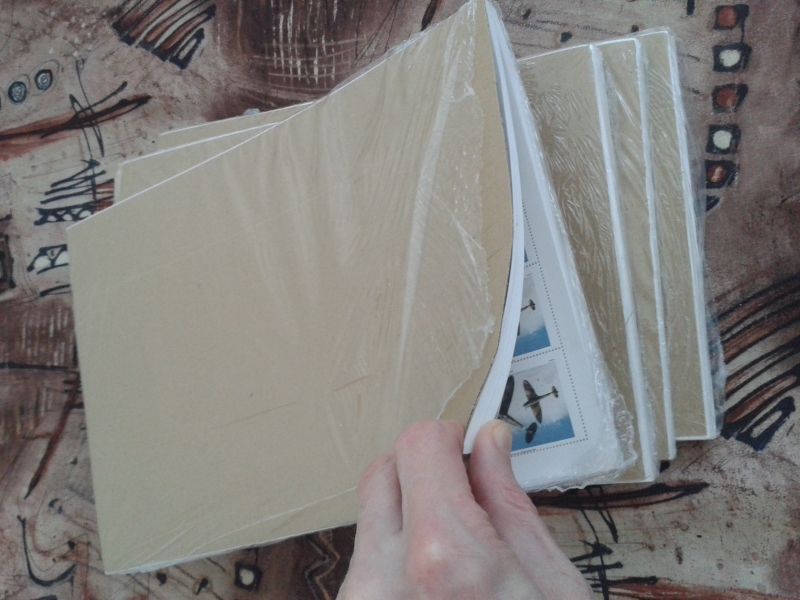 Therefore please use my pages to authenticate them before putting money down on them and getting ripped off! 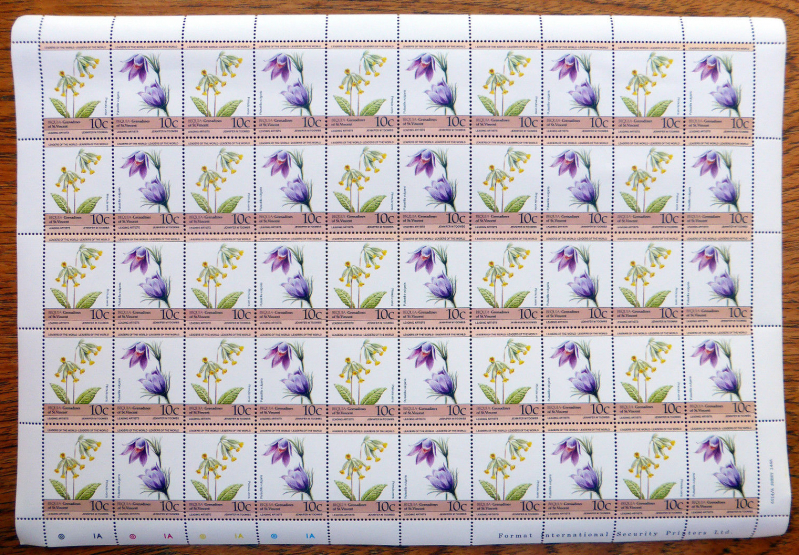 Here is an image of the Saint Vincent Bequia 1985 Flowers 10c stamp pane from the original printing. Now here is an image of a corner block from a fake stamp pane. 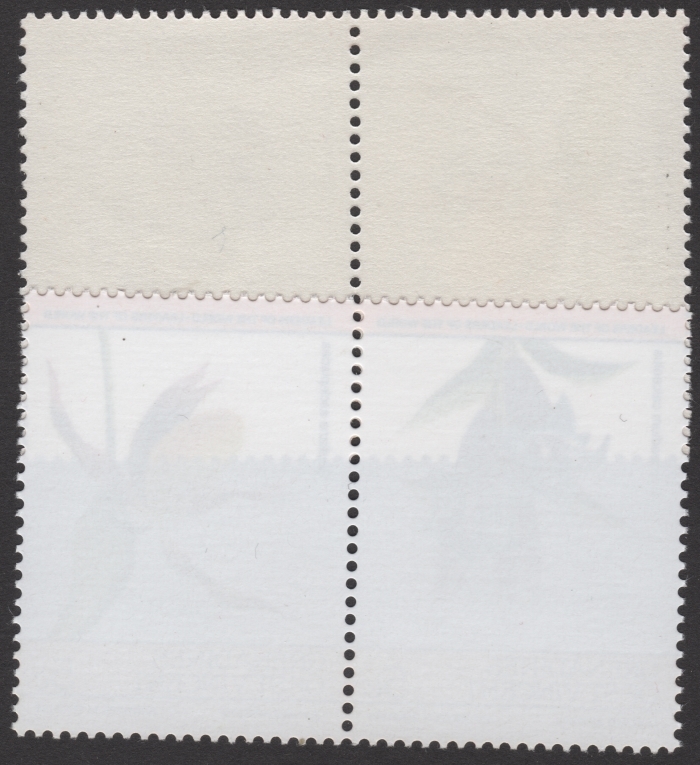 Now look at the image of the pane and the image of the fake stamp with selvage shown above. Can you see the difference? Also the pane numbers of the panes are completely different on examples I have found of other forgeries! Format never changed pane numbers on reprints. Indeed several issues that I have researched and obtained the original varieties of are effected. Mainly some fake imperforates. I am a professional tradesman and have never depended on stamps to live on. There are many that do depend on stamp sales though and it is for them also that I have created this section of the website. 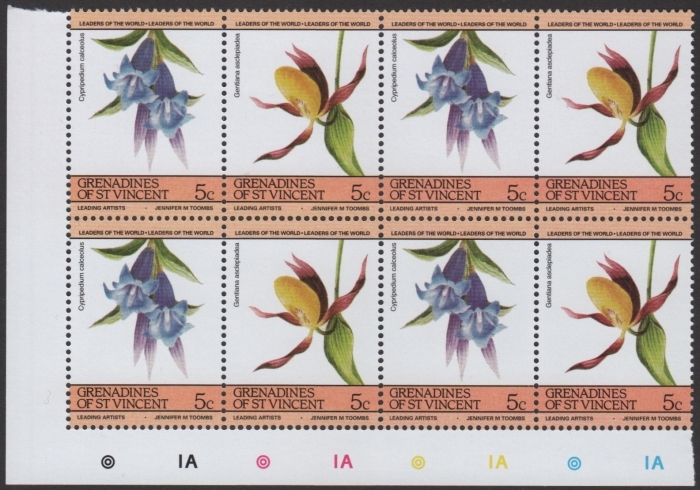 You can now define the Saint Vincent Grenadines 1985 Leaders of the World Flowers stamp forgeries easily and can now possibly avoid being ripped off! Sorry to say this, a lot of you already have been fooled and more of you will be until the right people get serious about it! Here are links to images of each stamp with an original next to a fake. All are scanned at 1200dpi so the files are large. All were scanned at the same time with the same settings and nothing is enhanced. Please be patient with downloading them because each file is around 8 megs.